As a Masters student, I often wondered about the possible applications of the Theory of Relativity in real life. Now fifteen years later, while sitting at my desk as the recently appointed head of our office in South Sudan, I understand. A young man came to me with a request for a salary advance at the end of another day in the ‘deep field’ - a day full of nuisances and challenges. The form bore two signatures, which gave me some reassurance the request had gone through some initial screening process. I asked him for his name and what he did for WFP. The answer didn’t come immediately, so I repeated my question. 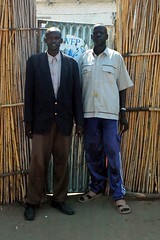 After some seconds of hesitation, he uttered a few words in Dinka, the local language. Being Italian, I had no difficulty in using my body language to make him understand to come back with an interpreter which he did. His name and function though, did not match those on the form. I asked the translator, one of the two signatories, why the name on the form was not the same name as that provided by the young man. - “Well, because that’s his brother’s name”, the interpreter replied. - “And where is his brother?” I queried. - “He deceased a couple of months ago!” he said. He certainly had a point and I was about to mellow out. I held my breath for a moment, thought to answer, but could not but smile. I closed my laptop and called it a day. News: Would You Not Pay US$10? News: Humanitarians Become Terrorist Target. Rumble: What is new on this site? Rumble: Have We Become Disaster Gypsies? News: Darfur. Do We Still Care? News: Colleague Died in Algiers Bombing.